We offer repair services on all customized and fleet vehicles. Give us a call today to arrange for repair service. We use only the most trusted brands and resources when working on your vehicles. Plus, we adhere to many federal and state standards. Our preventive maintenance solutions allow you to run your business without worry. Keep your vehicles in shape! We offer custom-built fleet and individual specialty vehicle solutions in Long Island, NY. We have a complete program available to help you design, maintain, and repair your vehicles. Contact Limo Bus & Truck Fleet SVCS to create a package that works best for you. Maintenance is a certified federal inspection center. We inspect vehicles in accordance with Federal Motor Carrier Safety Administration (FMCSA), Department of Transportation (DOT), Occupational Safety and Health Administration (OSHA) and New York State. A&D is qualified and authorized to perform inspections on trucks, trailers, forklifts and other hydraulic equipment. Performing regular inspections insures safe operation of equipment within the necessary guidelines, and prevents the need for major repairs by eliminating problems before they occur. Limo Bus Truck Fleet maintenance is a Bus & truck and trailer maintenance company based on Long Island, with state of the art equipment and highly experienced staff. We are a family owned business with over 30 years experience; our expert staff is ready to help no matter how big or small the job. When you need experienced and reliable service for your Bus Limo truck, trailer or other equipment, we are the ones to call. Our service staff includes experienced and certified mechanics, welders, fabricators, and auto body technicians who have the skills to perform repairs and maintenance in a timely and professional manner. 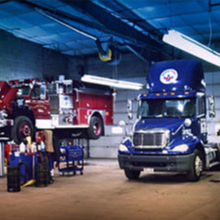 In order to focus specifically on your needs, our facilities are divided into three separate sections which include our truck, trailer, and auto body repair and maintenance shops. Over our 30 years of experience, Limo Bus Truck Fleet Maintenance has become recognized as a leader in all levels of truck and trailer services; specializing in tractors, trailers, fork lifts, Box Truck Repair, Coach Bus Repair, and hydraulics. Our body shop can service vehicles of all shapes and sizes. Whether you've got an 18 wheeler or a compact car, we have a full service body shop with equipment and staff available for all your auto body needs, specializing in welding (steel and aluminum), fabrication, paint jobs, and repair of lift gates, sheet metal, fiberglass, and collisions. Limo Bus Truck Fleet Maintenance is an official federal and New York State inspection station, performing inspections on trucks, trailers and other equipment. We welcome all work, big or small. Call us today for your free estimate. Limo Bus Truck Fleet Maintenance is a certified inspection center. We inspect vehicles in accordance with Federal Motor Carrier Safety Administration (FMCSA), Department of Transportation (DOT), Occupational Safety and Health Administration (OSHA) and New York State. Limo Bus Truck Fleet is qualified and authorized to perform inspections on Limousines Buses trucks, trailers, forklifts and other hydraulic equipment. Performing regular inspections insures safe operation of equipment within the necessary guidelines, and prevents the need for major repairs by eliminating problems before they occur. at Limo Bus & Truck Fleet SVCS.